KE00023 is a solid phase sandwich Enzyme Linked-Immuno-Sorbent Assay (Sandwich ELISA). 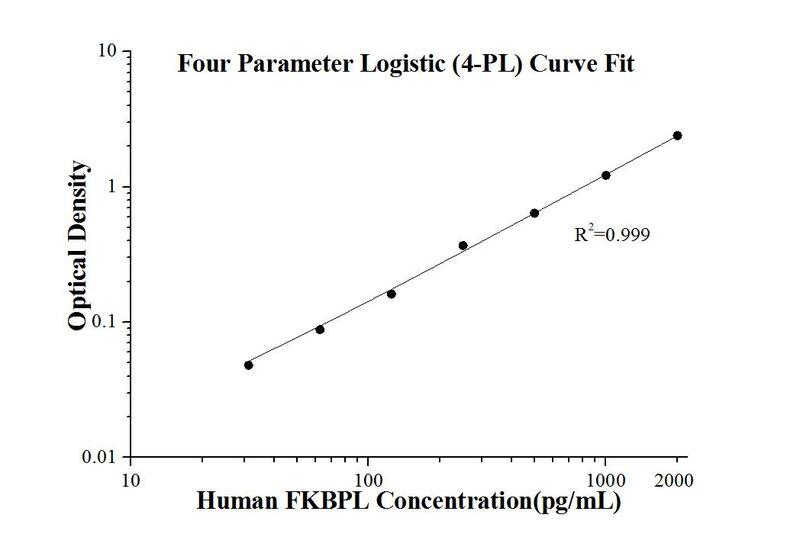 The FKBPL ELISA kit is to be used to detect and quantify protein levels of endogenous FKBPL. The assay recognizes human FKBPL. A polyclonal antibody specific for FKBPL has been pre-coated onto the microwells. The FKBPL protein in samples is captured by the coated antibody after incubation. Following extensive washing, a monoclonal antibody specific for FKBPL is added to detect the captured FKBPL protein. For signal development, horseradish peroxidase (HRP)-conjugated antibody is added, followed by Tetramethyl-benzidine (TMB) reagent. Solution containing sulfuric acid is used to stop color development and the color intensity which is proportional to the quantity of bound protein is measurable at 450nm with the correction wavelength set at 630 nm. FKBPL, also named as DIR1, NG7 and WISp39, has similarity to the immunophilin protein family, which plays a role in immunoregulation and basic cellular processes involving protein folding and trafficking. It is thought to have a potential role in the induced radioresistance, probably by increasing the rate of DNA repair in cells exposed to X rays. Breast cancer cells stably overexpressing FKBPL became dependent on estrogen for their growth and were dramatically more sensitive to the antiestrogens Tamoxifen and Fulvestrant, whereas FKBPL knockdown reverses this phenotype. FKBPL is an estrogen-inducible gene that acts as a cochaperone in ERa/Hsp90 molecular complexes; furthermore, FKBPL levels may be both a prognostic indicator and determinant of response to endocrine therapy.This kit is used to quantify FKBPL level in vivo.